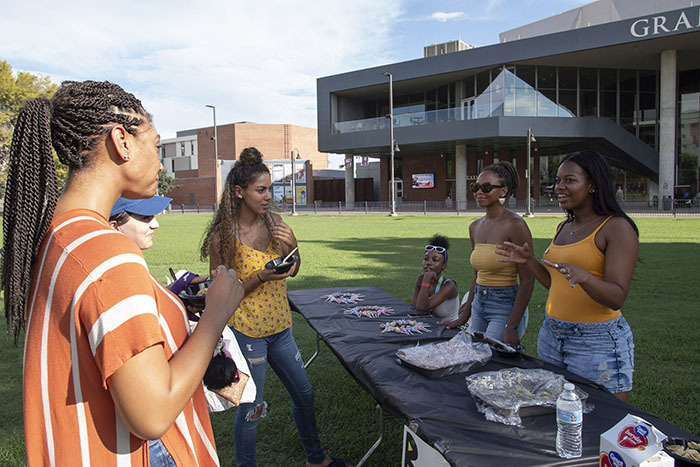 Members of Grand Canyon University’s Black Student Union speak with students at the Welcome Week Multicultural Festival Wednesday on the Quad. 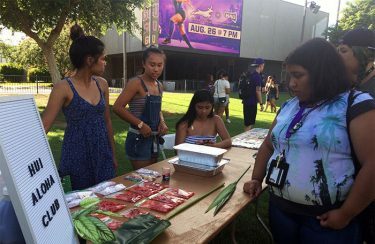 Students who stopped by the Grand Canyon University‘s Welcome Week Multicultural Festival on Wednesday afternoon got a taste of something a little different — or, something that felt right at home: li hing gummy bears, which are sprinkled with dried plum powder; lumpia, a type of skinny Filipino egg roll; or spam musubi, a kind of Hawaiian sushi, in this case a rectangle of spam nestled on a block of rice and then wrapped in nori. 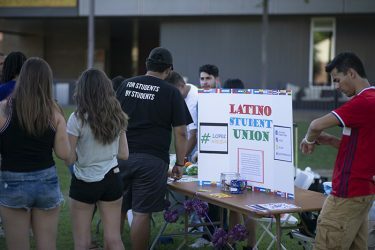 The Latino Student Union was one of four multicultural clubs at the festival. Also there: the Philippine American Student Association, Black Student Union and Hui Aloha Club. 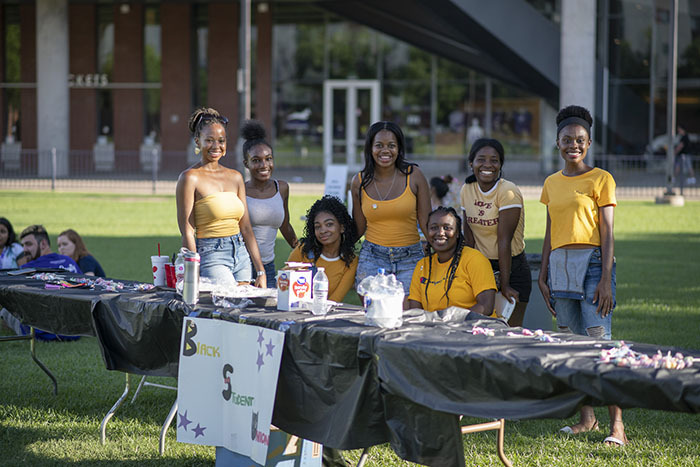 They also got to know some of the diverse multicultural clubs on campus — the Hui Aloha Club, Philippine American Student Association, Latino Student Union and Black Student Union. “We just want to let them know we’re here. The freshmen with culture shock, we want him or her to feel there’s a piece of home here with them,” Latino Student Union President Leonardo Quintero said. Quintero said he was one of those “freshmen with culture shock” when he arrived on campus a few years ago. He found the Latino Student Union and quickly found his place on campus, along with plenty of friends. 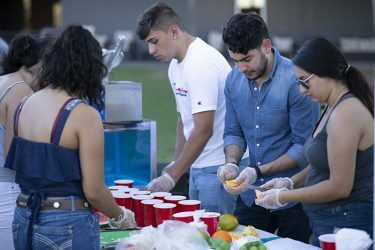 The members of the club, about 300 members strong, busied themselves slicing jicama, limes, watermelon, mangoes and other fruit to serve the students who stopped by their table on the Quad. “The biggest thing we like to do is bring community values: food, culture and family. The big one is family, though right now we’re obviously using our food values,” he said with a laugh, adding how the club does not want to be overly inclusive nor overly exclusive. 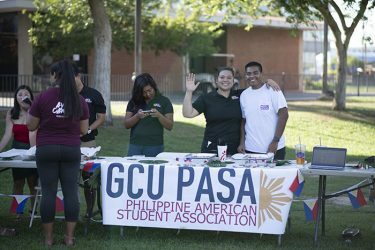 The Philippine American Student Association and other multicultural clubs said they want to offer a piece of home to incoming students. Next to their table, the Philippine American Student Association handed out samples of adobo — a dish, usually chicken or pork, flavored with soy sauce, vinegar, bay leaves and peppercorn. They also sold lumpia. This is the club’s second year on campus. “As the University is growing, so are the students in the club,” said Michelle Bernal, CASA co-president. Club secretary Constance Aguirre said the club’s membership has jumped from 25 to 75 and now is at 150. 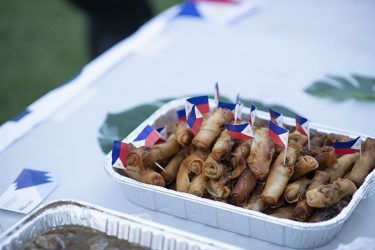 The Philippine American Student Association introduced students to Filipino cuisine, such as lumpia, which are Filipino-style egg rolls. When the club meets, the members not only share Filipino food, such as lumpia and adobo, they play games popular in the Philippines. They also introduce a Filipino word of the day, just for fun. The 200-member organization organizes events such as worship night and shares gospel music. The group was at the Quad offering up bowls of banana pudding. The neighboring Hui Aloha Club — the campus’ Hawaiian club — encouraged students to try not only li hing gummy bears and spam musubi but butter mochi, a treat made with coconut milk and mochiko (glutinous rice flour). The group meets for activities such as hiking, and last year members organized an end-of-year luau, complete with hula dancing. Senior Kaela Ho, who was manning the Hui Aloha table, said she hoped the club — which she emphasized is open to everyone — would be seen as having that warm island hospitality. Freshman film major Alizabeth Esparza, from Corona, Calif., stopped by the Multicultural Fair, she said, because she’s Latina and wanted to connect with the Latino Student Union. The Latino Student Union cut jicama, mango, limes, watermelon and other fruit and served beverages that reflected the Latino culture. Jocelin Hernandez, a freshman elementary and special education major, piped up when she heard Esparza was from Corona: “Hey, I’m from Victorville,” she said to Esparza. The two cities are an hour apart. “I just wanted to meet new friends,” Hernandez said — and it looked as if she did.